Bubby and Bean ::: Living Creatively: 1 YEAR BLOGIVERSARY GIVEAWAY >> Win 7 Prizes Worth $200! 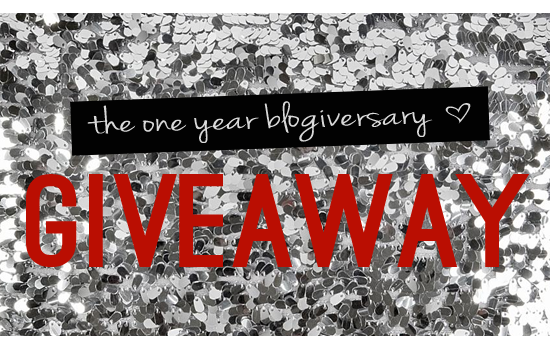 1 YEAR BLOGIVERSARY GIVEAWAY >> Win 7 Prizes Worth $200! Guess what?! Today is Bubby and Bean's one year blogiversary! Honestly, I can't believe it's only been a year. 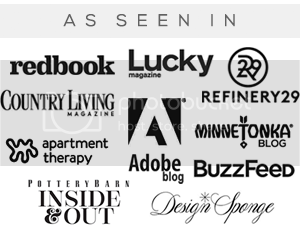 This little online design + style magazine/journal started out as a side project and companion blog to my businesses. I had no idea one year ago that it would evolve into such a big part of my everyday life. There will be a special post tomorrow all about Bubby and Bean's first year and what I have planned for year two. I have a lot to share with you all! Today, it's all about the celebration. And what better way to celebrate our first birthday than with our biggest group giveaway ever? We have compiled a seriously amazing prize package full of goodies from several of our wonderful November sponsors, as well as a couple of treats from Bubby and Bean. This package of 7 prizes is worth nearly $200, and one of you will win it all! 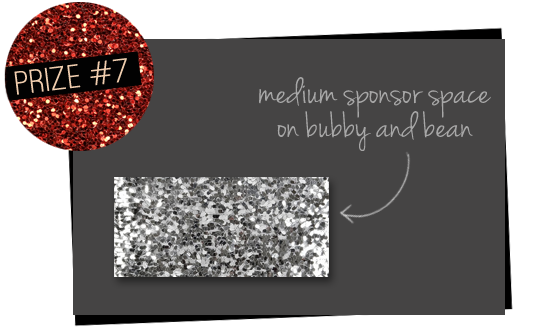 A Medium Sized Sponsor Spot here on Bubby and Bean! The Blogiversary Giveaway winner will receive a 215x100 pixel advertising space on Bubby and Bean for the month of January, 2012. This is an amazing way to spread the word about your blog, small business, Etsy shop, band, art, or organization to thousands everyday. Hurray! If you aren't in need of advertising space, this also makes a fabulous gift for a friend who does. $30 value. *This giveaway is open to all Bubby and Bean followers/subscribers. If you're a new reader, just make sure to follow/subscribe first using Google Friend Connect or one of these readers. *Please put each extra entry in a SEPARATE comment. 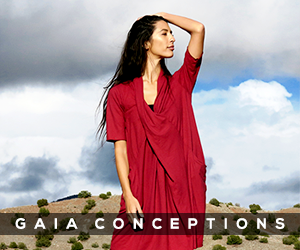 >> Visit any of the shops from this giveaway and list your favorite item. The giveaway will go until November 29th and the winner's name will be randomly drawn via random.org and posted here on or around November 30th, so make sure to check back to see if you won. Big thanks to the November sponsors who contributed such beautiful items to this very special giveaway in celebration of one year of Bubby and Bean! I'm thankful that my family and my hubby's family get along and we can all have Thanksgiving together. I am thankful for my fiance and our two cats. I am super thankful that this year we made the move from Ohio to Wisconsin so I can be closer to my family, especially my little sister. AND I follow your boards on pintrest - love your home and interior board! Yay happy bloggy birthday. I would love to enter this wonderful giveaway! Right now I'm very thankful for my friends who are so fun and distract me from the stresses of running my own little business. I follow you by GFC btw. I am thankful for a roof over my head and food on the table and wonderful friends and family to share it with. I'm thankful for my little family of three: a handsome husband, a beautiful baby boy, and me! p.s. I follow your blog via google friend connect! I am so very much thankful for the fabulous family and friends that surround me and support me. I have such a strong support group and what is life without awesome relationships? I subscribe using google friend connect! what a cute, cuuuuuute giveaway! i am thankful for this much needed week off at home with my family. and i follow you via blogger! 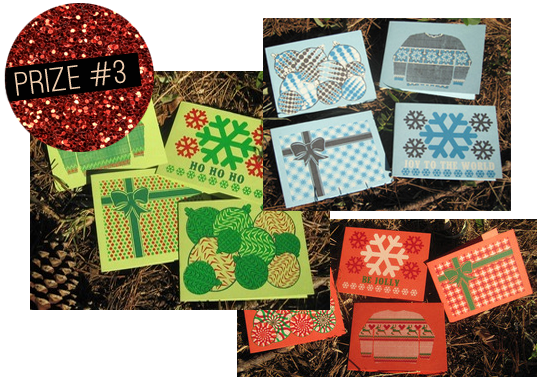 i love those cute xmas cards, especially the blue sweater holiday ones! aaaaaand i liked your FB page! 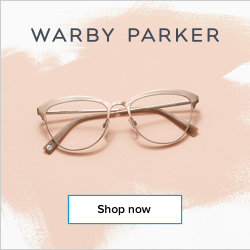 annnnnnd i follow you on bloglovin'! hope to win! I'm thankful for my family and friends being in the hugging distance from me. It's ridiculous how much I miss them! 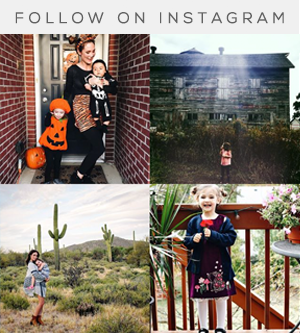 I folllow via gfc and bloglovin! This week I am thankful for my husband of one month writing me a letter about how thankful he is for our lives and our lives together this morning! I follow Bubby and Bean through google friend connect. From inde darling I love the slacker beanie in bubblegum pink. From flexed family arts I love the Forced photo print. From the paper puddle I love the blue holiday sweater holiday cards. From the Little White Chapel I love the vintage ivory flower ring. From live the life you love I like the cherry blossom tank. 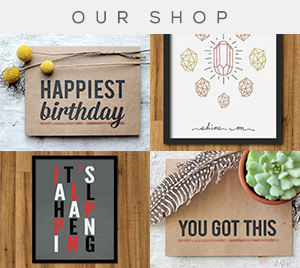 From your shop Bubby and Bean I love the Do something creative everyday print! I am thankful for family, and I follow your blog via email. I like the Storm Trooper Helmet Embroidered Wall Art from flex family arts. What an amazing giveaway! Congratulations on your one-year blogging anniversary! This year I am thankful that even though my family is far away I have close friends near by :) I follow through GFC! I am grateful for my friends & family, who are always there for me when I need them. I'm thankful for God's providence through six months (so far) of unemployment... not only have I avoided going more into debt, but I paid off my car! I follow you via NewsFire feed reader. I'm really thankful to be alive, healthy, and recovered this year. Being with my family and able to spend more time with them is more than I could ask for. I'm a new reader and follow through Google Reader. awesome! I'm thankful for a warm home and plenty to eat. I am thankful for beautiful weather here that has let me get into my garden so there will be lots of lovely produce this season. I am thankful for my lovely little boy and his first Thanksgiving! GFC follower!! Love your blog! I LOVE the beanies from Indie Darling so much!! Hi Melissa! This week, I'm thankful for my dad and mum! In going on an overseas trip with then early December, and Ive never been abroad. I'm petrified of venturing beyond my comfort zone, but I know that I will miss them dreadfully so if Im not with them. I'm here by SailorJennie recommendation, you are one of her favorite blogs hit his month, how very sweet of her don't we all think? I'm following Bubbly and Bean via GFC(BethQuahSooJing . And email notifications. I Like Bubby and Bean on Facebook. My facebook name is Beth Quah SooJing. I'm following Bubby and Bean on BlogLovin . I am grateful for my family, my friends, my health, my sweet dog Lucy, and most of all, my loving fiance. 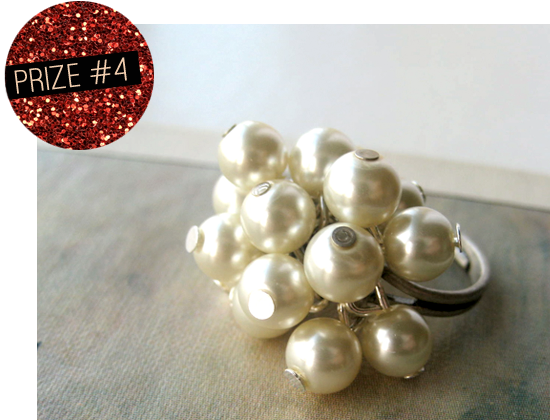 My favourite item is Little White Chapel's Pearl Cluster Bridal Bracelet - gold, silver, antique brass, rhinestone. It's beautiful. I'm thankful for my friends and family. Without them, I'd be lost! I follow in Google Reader! The Flex Family stores are super cool! 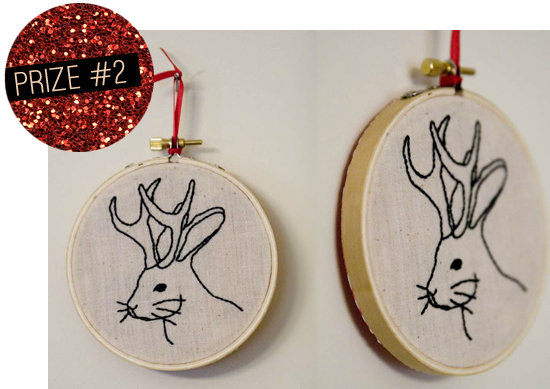 I love the jackalope (because I have a bunny), but my BF would be all about the Big Lebowski & Andy Warhol embroideries! I am thankful for a place to call home. I often think about the people that are homeless, especially on cold winter days.. I'm thankful for my two puppies, Hua & Hinano <3 I follow your blog with Google Reader. I am so thankful that all of my family will be here this Thanksgiving. However, not for the best circumstances. 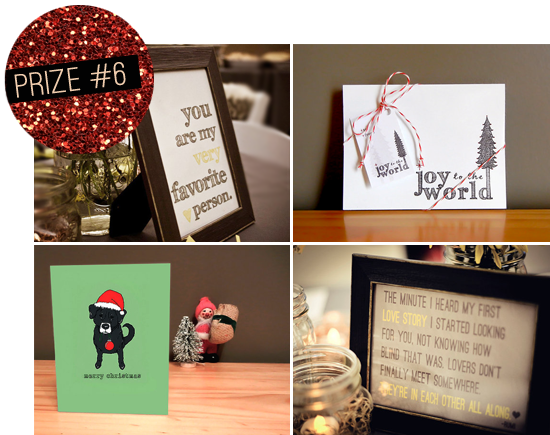 Folllowing on Pinterest as Jaimie T.
I like your holiday greeting cards the most!!! I'm thankful for my family, my teaching job, my car and my health. I'm following you on pintrest! Amazing giveaway! I'm following via google connect. This year I'm thankful for having people in my life that believe in me & push me to stay in school. I am so thankful for my education and those who have been supporting me through it all. I follow you daily and keep this blog as a bookmark on my toolbar. I just liked you on facebook too! and now on Pintrest, too! I am thankful for spontaneous moments with awesome friends and Christmas time. I am thankful for my girls! I follow via GFC. I'm thankful for my family this week! I am following and found out about this giveaway on Google Reader! thanks! I follow you on Pinterest as Helena! This was what my dad called the "survivor Thanksgiving". My father almost died that day, but he didn't, and I can't be more thankful than that. So thankful for 1)my family, 2)my thriving Hawaii life, 3)education, water, shelter, food, etc. I am thankful that I to to Las Vegas in a week. I follow through GFC. I am thankful that I got my Christmas lights up while it was 60 degrees! I'm thankful for toddler giggles. I follow on google reader! I'm so thankful for my family's health! I'm thankful for happy, healthy kids and a caring, welcoming extended family. I'm also thankful to live in Southern California, where we were able to sit on the deck and enjoy the ocean in enjoyable 75 degree weather at the end of November. I follow with GFC (Kasee Johnson) and Facebook (Kasee Jones Johnson). I follow on GFC and I am most thankful for my four beautiful children!! I "like"d Bubby and Bean on Facebook. My FB name is Kasee Jones Johnson. 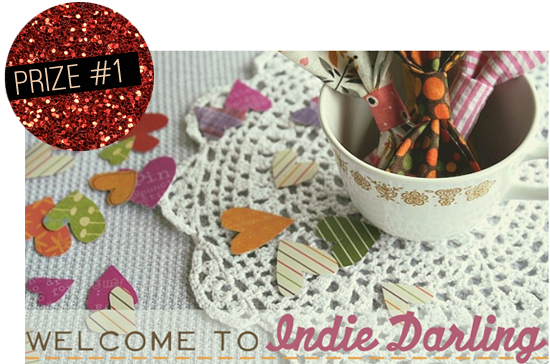 I visited Indie Darling and I love the Ice Princess Necklace. It would look amazing on my daughter, Charlee. Option Entry: I follow you on Pinterest. i follow through google reader and i am thankful that i am almost done with my masters!! !